Introduction: Digital photographs play a substantial role in the presentation and validation of clinical cases for documentation and research purposes in esthetically oriented professions such as dentistry. The introduction of sophisticated cameras and "easy to use" computer software readily available on today's market has enabled digital fraud to emerge as a common and widely used practice. Hence, it is essential that both dentists and editorial circles are aware and cautious with regard to the possibility of digital fraud. Materials and Methods: A set of 10 routine "pre-" and "post" treatment dental procedure photographs were taken and randomly manipulated using standard desktop software. A team of 10 dental professionals were selected and each one of them was individually requested to review and evaluate the authenticity of the photographs. Results: An assessment of expert opinion revealed an overall sensitivity of 60% and a sensitivity of 15% in correctly identifying a manipulated photograph, which is considered low. Furthermore, there was poor interobserver agreement. Conclusion: Advanced technology that is easily available has resulted in adept digital fraud that is difficult to detect. There is a need for awareness among both dental practitioners and the editorial circle regarding misrepresentation due to image manipulation. It is therefore necessary to follow a skeptical approach in the assessment of digitalized photos used in research and as a part of clinical dentistry. An in vitro study was conducted to compare the retentive strengths of zinc phosphate, polycarboxylate and glass ionomer cements using Instron universal testing machine. Thirty preformed and pretrimmed stainless steel crowns were used for cementation on 30 extracted human primary molars which were divided into three groups of 10 teeth in each group. Then the teeth were stored in artificial saliva and incubated at 37°C for 24 h. A load was applied on to the crown and was gradually increased till the crown showed dislodgement, and then the readings were recorded using Instron recorder and analyzed for statistical significance. The surface area of crown was measured by graphical method. The retentive strength was expressed in terms of kg/cm 2 , which was calculated by the equation load divided by area. Retentive strengths of zinc phosphate (ranged from a minimum of 16.93 to amaximum of 28.13 kg/cm 2 with mean of 21.28 kg/cm 2 ) and glass ionomer cement (minimum of 13.69 - 28.15 kg/cm 2 with mean of 20.69 kg/cm 2 ) were greater than that of polycarboxylate cement (minimum of 13.26 - 22.69 kg/cm 2 with mean of 16.79 kg/cm 2 ). Negligible difference (0.59 kg/cm 2 ) of retentive strength was observed between zinc phosphate (21.28 kg/cm 2 ) and glass ionomer cements (20.69 kg/cm 2 ). Glass ionomer cements can be recommended for cementation of stainless steel crowns because of its advantages and the retentive strength was almost similar to that of zinc phosphate cement. 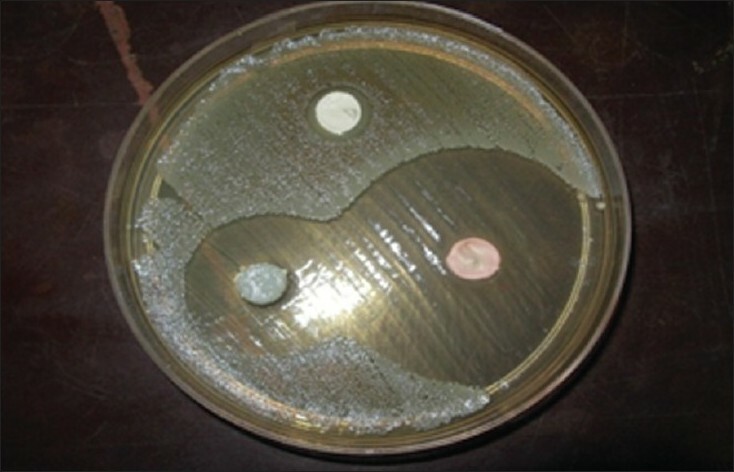 Background: Microbes are considered as the primary etiological agents in endodontic diseases. The ways of reducing these agents are root canal debridement, antimicrobial irrigants, and antibacterial filling materials. But the complexity of the pulp canal system presents a problem for chemomechanical preparation. One of the factors determining the success of endodontic treatment is the sealing material with a potent bactericidal effect. Aim: The aim of the present study was to assess the antimicrobial activity of endodontic sealers of different bases - in vitro. Materials and Method: The antimicrobial activity of three root canal sealers (endomethasone, AH 26, and apexit) was evaluated against seven strains of bacteria at various time intervals using the agar diffusion test. The freshly mixed sealers were placed in prepared wells of agar plates inoculated with the test microorganisms. The plates were incubated for 24, 48, 72 hours, and 7 and 15 days. The mean zones of inhibition were measured. Statistical Analysis: All statistical analysis was performed using the SPSS 13 statistical software version. The analysis of variance (ANOVA), post-hoc Bonferroni test, and paired t test were performed to reveal the statistical significance. Results: Statistically significant zones of bacterial growth inhibition were observed in descending order of antimicrobial activity: endomethasone, AH 26, and apexit. Conclusion: Zinc oxide eugenol based root canal sealer produced largest inhibitory zones followed in decreasing order by epoxy resin based sealer and least by calcium hydroxide based root canal sealer. A study was conducted to evaluate and compare the effect of cavity disinfectants on the fracture resistance of primary molars restored with indirect composite inlays. Thirty-six non-carious primary second molars were selected and divided randomly into three groups (n = 12): control group (no disinfectant), chlorhexidine group (disinfected with 2% chlorhexidine for 40 seconds) and sodium hypochlorite group crowns (disinfected with 2% chlorhexidine for 40 seconds). The inlays were fabricated by indirect method using Ceram X nanocomposite on plaster die. 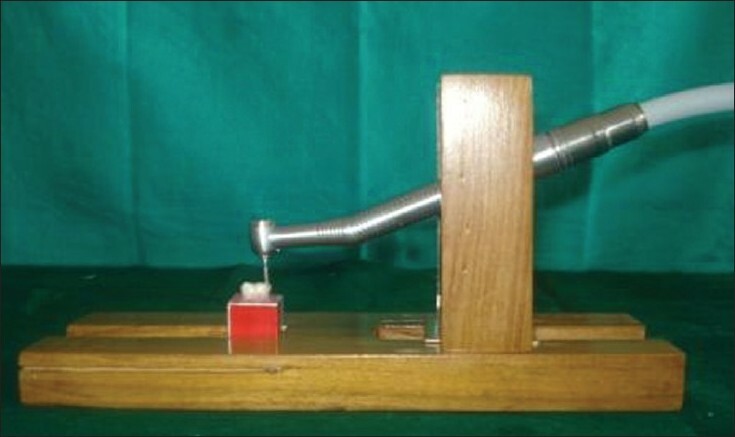 All the groups were submitted to compression mechanic test in a Hounsfield universal testing machine at 1 mm/min cross-head speed and the results were calculated in Newtons. Descriptive statistics, independent t test, and one way analysis of variance (ANOVA) test revealed the mean fracture resistance of three groups, i.e., control group, chlorhexidine group and sodium hypochlorite group to be 2260.66, 1858.08 and 1310.66, respectively. When intragroup comparisons were made, a significant difference was observed in all the groups (P<0.001). Scheffe's post hoc test revealed that control group had the highest fracture resistance, followed by chlorhexidine group, and sodium hypochlorite group had the least fracture resistance. Each value differed significantly from the other (P<0.05). Cavity disinfectants used in the present study had detrimental effect on the fracture resistance of primary molars. Among the disinfectants employed in the present study, chlorhexidine showed a better resistance to fracture than sodium hypochlorite. Background: Remineralization process is accelerated by the presence of fluoride ions in the oral environment, but this mechanism of caries reversal will be further enhanced if the concentration of calcium, phosphate and fluoride ions is supersaturated with respect to that of oral fluids. Aim: This in vivo study was carried out to evaluate and compare the remineralizing efficacy of a urea-based mineral-enriched mouthrinse and a fluoridated dentifrice using an in vivo intraoral appliance model and polarized light microscopic evaluation technique. Materials and Methods: The specimens were prepared from sound teeth and artificial caries was produced using an artificial caries medium in vitro and enamel specimens were inserted in removable orthodontic appliances that were to be worn by 14 children of 10-15 years of age. They were divided into three groups - nonfluoridated dentifrice, fluoridated dentifrice and mineral-enriched mouthrinse groups. 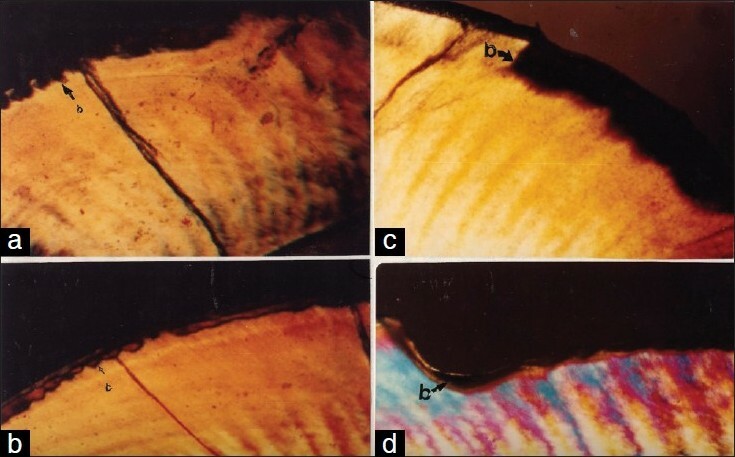 After the 6-month experimental period, during which the enamel specimens inserted in the intraoral appliance were subjected to one of the agents (either fluoride, nonfluoride dentifrice or mouthrinse) in vivo, the specimens were retrieved from the patients and were evaluated using the polarized light microscopic technique. Observations and Results: On analysis, mineral gain occurred in all groups, viz. nonfluoride dentifrice group, fluoride dentifrice and mineral-enriched mouthrinse group. However, it was found to be complete in the mouthrinse group, i.e. both at the surface and at the subsurface (67%), while in the fluoridated dentifrice group, 43% of the samples showed mineral gain in both zones. In the nonfluoridated dentifrice group also, remineralization occurred but was limited either to the surface or the subsurface zone. Conclusions: Urea-based mineral-enriched mouthrinse was shown to be more efficacious in the process of remineralization of artificial carious lesions. Aim: The purpose of this in-vitro study is to determine the efficacy of various irrigants in removing the smear layer in primary teeth root canals after hand instrumentation. Materials and Methods: The present study consisted of 30 human primary incisors which were sectioned at the cementoenamel junction horizontally. The specimens were divided randomly into four experimental and one control group having six teeth each and each group was treated with the specific irrigant. 5.25% NaOCl, 5.25% NaOCl + 10% EDTA, 6% citric acid, 2% chlorhexidine, saline (control) were the irrigants evaluated for efficacy in removal of smear layer. The specimens were split along the longitudinal axis using a chisel after placing superficial grooves in cementum not extending to the root canal. The exposed surface was subjected to scanning electron microscopic analysis to reveal the efficacy of irrigants in removal of smear layer. The representative areas were evaluated twice at 15 days interval by a single evaluator. The scale for the smear layer removal by Rome et al was modified and used in the present study. Results: The pictures from the scanning electron microscopy showed that among the tested irrigants, citric acid has the best efficacy to remove the smear layer without altering the normal dentinal structures, which was supported by the lowest mean smear scores. 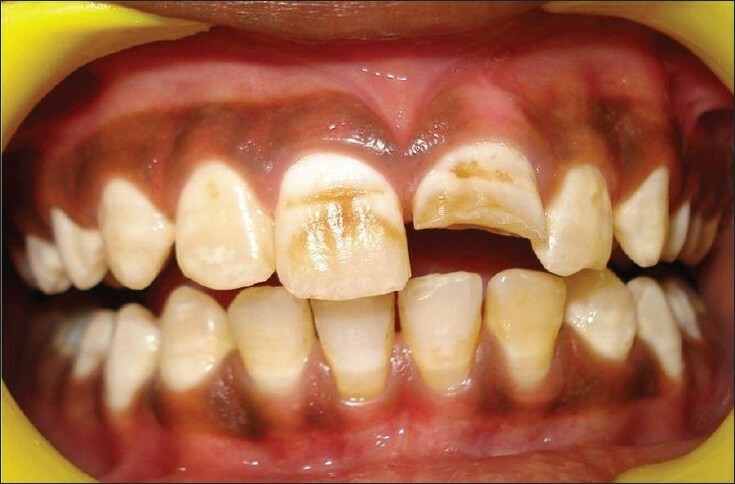 The pictures from the 10%EDTA + 5.25% sodium hypochlorite group showed that even though it removed the smear layer, it adversely affected the dentine structure. 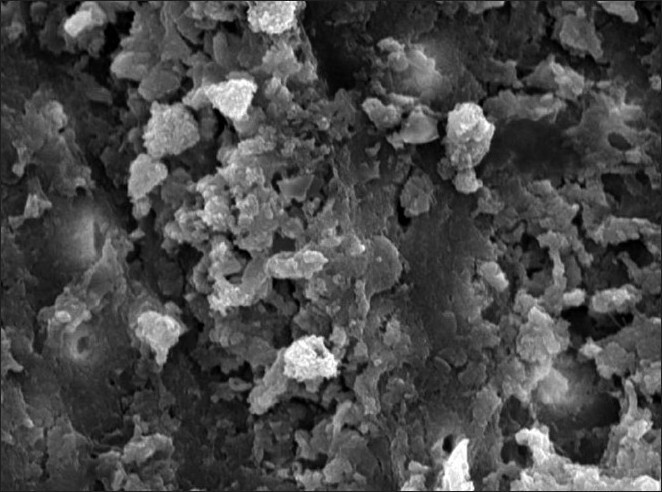 SEM pictures of the other groups like sodium hypochlorite, chlorhexidine revealed that these irrigants does not have the capacity to remove the smear layer in primary teeth. Conclusions: The results of the present study clearly indicate the superior efficacy of 6% citric acid than the other tested irrigants on removing the smear layer in primary teeth root canals. The present study is undertaken to find out the pH of resting plaque in children with no caries, moderate caries and rampant caries and to determine the modulations of plaque pH with different sugar solution rinses viz: sucrose, glucose and fructose. The study was carried out on forty five children, in the age group of 3-10 years (25 males and 20 females). The child was given 10 ml of test solution and was asked to rinse and swish it in the mouth for a period of 30 sec. Plaque samples were taken from 20 different spots after 5, 10, 20 and 30 min of the rinse and pH values of all the samples were determined. Results show that there was a statistically significant (P<0.05) difference between the pH values of plaque at different intervals of time with sucrose, fructose and glucose solution rinse in children with moderate caries, rampant caries as compared to the caries free group. Sucrose was found to be highly cariogenic in all the children with a greater potentiating effect in moderate and rampant caries. Glucose also appeared to have a cariogenic role while fructose had the least of it all. Children under the age of 5 years generally spend most of their time with their parents and guardians, especially mothers, even when they attend pre-schools or nurseries. It has been found that young children's oral health maintenance and outcomes are influenced by their parent's knowledge and beliefs. This study was done to assess the mother's knowledge about the oral health of their pre-school children in Moradabad, India. Mothers of children aged 1-4 years, attending the hospital for vaccination or regular checkups in the pediatric division of government hospitals, were invited to participate in the study. A 20-item questionnaire covering socio-demographic characteristics, dietary practices, oral hygiene practices and importance of deciduous teeth, was distributed to their mothers, during their visit to the hospital. Responses of the mothers were recorded on a Likert Scale. The sample comprised 406 mothers, with the mean age of children being 3.8 years. Three hundred (73.8%) mothers had a good knowledge about diet and dietary practices, while only 110 (27.1%) and 103 (25.4%) mothers were found to have a good knowledge about the importance of oral hygiene practices and importance of deciduous teeth, respectively. Mothers with higher educational qualification and information gained through dentist had a better knowledge about child's oral health. Oral hygiene habits and dietary habits are established during pre-school days and the parents, especially mothers, function as role models for their children. The normal root canal anatomy may be altered in various pathological processes and making it very difficult and at times impossible to achieve ideal obturation by normal methods. Internal resorption is one among them. There are several treatment protocols advised for this pathological condition. A crown-root fracture is defined as a fracture involving enamel, dentin and cementum and accounts for 5% of all traumatic injuries to the permanent dentition. In anterior teeth, these fractures are usually caused by direct trauma and often complicated in fully erupted teeth. In cases where the fracture line extends down along the long axis of the root, extraction of the tooth is indicated. The purpose of this report is to present the use of light transmitting post system to reinforce the crown root fractured maxillary central incisor due to trauma and internal resorption. 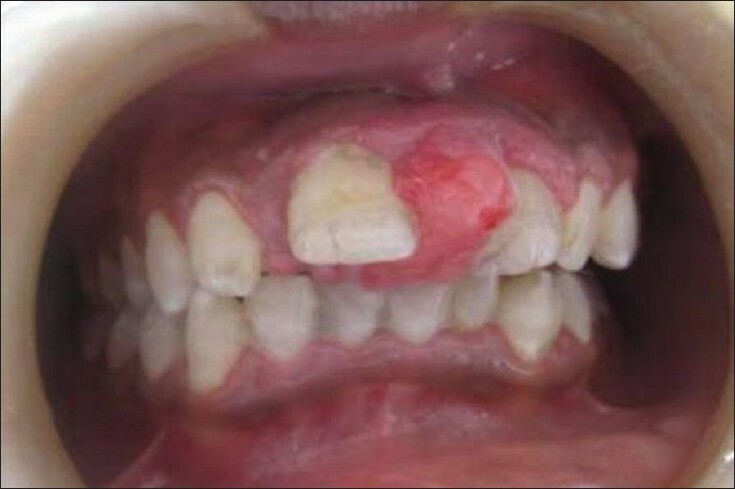 Peripheral giant cell granuloma is a benign reactive lesion of gingiva. It manifests as a firm, soft, bright nodule or as a sessile or pedunculate mass. This article reports the management of peripheral giant cell granuloma in a 12-year-old boy by surgical excision. Psoriasis is a common dermatological disease. It can occur at any age but usually develops between 15 and 35 years of age and may persist throughout a person's lifetime with periods of exacerbation and remission. The hyperproliferative state of the affected epidermis produces a turnover rate that is up to eight times greater than normal. Instead of being shed, the skin cells pile up, causing the visible lesions. Oral manifestations of psoriasis are rare clinical observations. 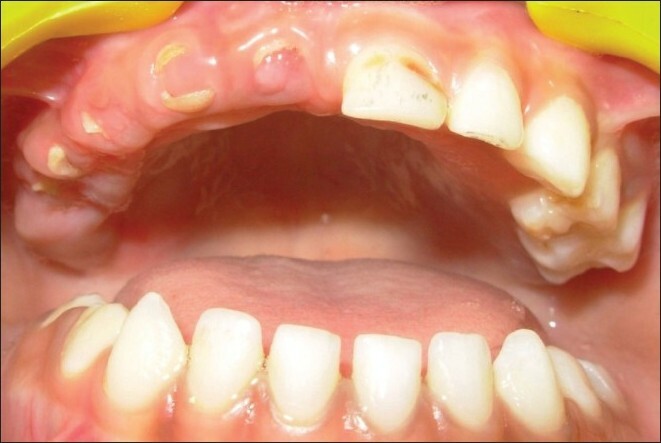 Lesions have been reported on the lips, buccal mucosa, palate, gingiva, and floor of the mouth. We document a presentation of psoriasis showing a triad: skin lesions, arthritis, and oral manifestations (oligodontia being patient's chief concern). Dental rehabilitation done was in the form of partial dentures. This was done to address the immediate concern of the patient, that is, inability to chew properly. As put forth through this case report, a potential link between psoriasis and oligodontia has scope for further study. Rickets is the failure of mineralization of osteoid and newly formed bones in a child skeleton. It is commonly associated with vitamin D deficiency; however, it can be because of a decrease in the serum phosphate levels leading to inadequate mineralization of cartilage and bone, consequent skeletal deformities, and growth retardation. The hypophosphatemic conditions that interfere in bone mineralization comprise many hereditary or acquired diseases. One of the hereditary types of hypophosphatemic rickets is the familial hypophosphatemic rickets. This rare variety was diagnosed in a 9-year-old patient who had come with a chief complaint of a missing tooth. In the present case, radiographic aspects of oral and systemic manifestations of familial hypophosphatemic rickets are highlighted. Everyone likes to see, hear, and know about rare things. An aneurysmal bone cyst (ABC) is an uncommon non-neoplastic lesion of the bone, mostly affecting long bones and spine. This rare jaw lesion usually affects the mandible but origin from the maxillary anterior region is even rarer. This paper describes a case of an ABC in an 8-year-old female child with a progressively increasing swelling in the right nasomaxillary region developed over a period of 1.5 months. Treatment consisted of the excision and enucleation of the lesion through an intraoral approach under general anesthesia. The higher prevalence in young adulthood has made the role of pedodontists vital in diagnosing ABCs, at the earliest. Cleft lip and palate is a birth defect occurring in the orofacial region. One of the immediate problems to be addressed in a newborn with this defect would be to aid in suckling and swallowing. 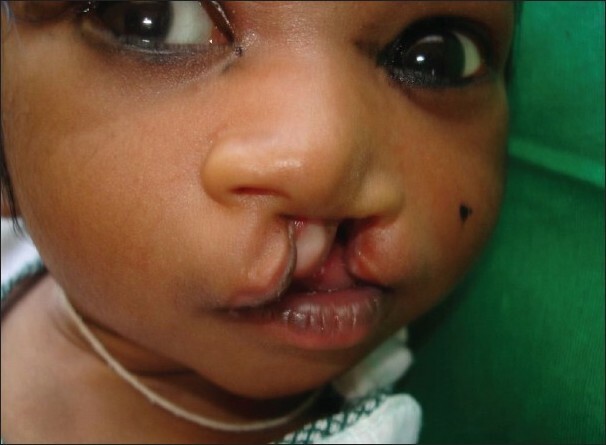 Here we present a case of a 5-day-old infant with unilateral cleft lip and palate for whom feeding obturator was made by using a simplified impression technique to facilitate feeding. Regional odontodysplasia (ROD) is a rare developmental anomaly involving both mesodermal and ectodermal components in a group of contiguous teeth. It affects the primary and permanent dentitions in the maxilla and the mandible or both, however, the maxilla is frequently involved. Although the etiology of the ROD is uncertain, it has been suggested that numerous other factors play a role. The treatment plan should be based on the degree of involvement as well as the functional and esthetic needs in each case. This article reports the case of a 5-year-old boy presenting a rare anomaly on the right side of the maxillary arch. The treatment performed was rehabilitation with temporary partial acrylic denture and periodic checkups. The extraction was followed by rehabilitation with dental implants. The main aim of this article is to provide valuable information to pediatric dentists about the review and treatment alternatives for ROD. Idiopathic agenesis of primary dentition is very rare. 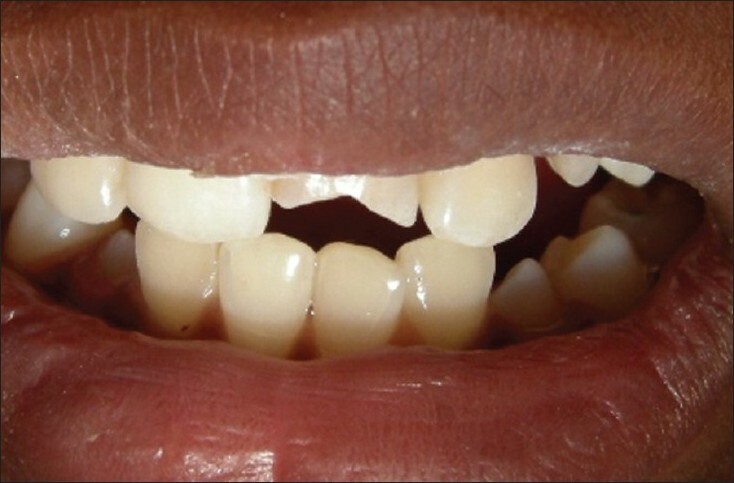 This is a case report of a 2-year and 6-month-old girl child who presented with 14 missing primary teeth. A review of the previous case reports is done and the management of these cases is discussed. Apert syndrome (acrocephalosyndactyly) is a rare developmental malformation characterized by craniosynostosis, mid-face hypoplasia, symmetrical syndactyly of hands and feet. 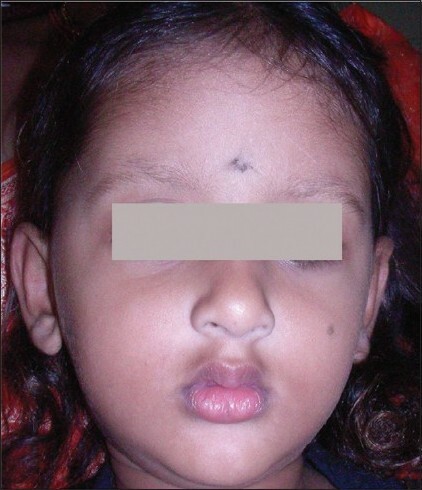 The prodromal characteristics for the typical cranio-facial appearance are early craniosynostosis of the coronal suture, cranial base and agenesis of the sagittal suture. 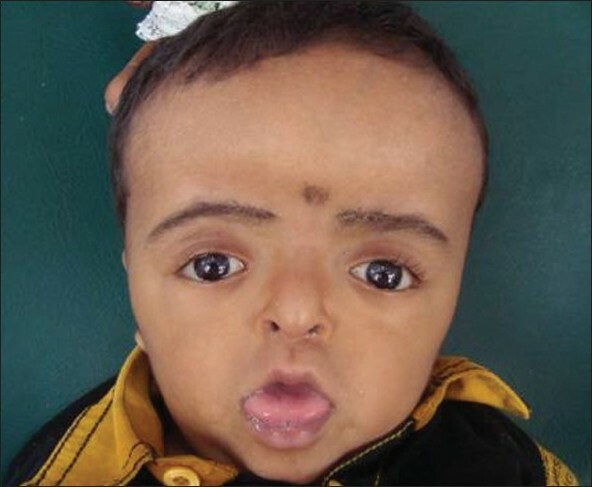 The purpose of this paper is to report a case of Apert syndrome with emphasis on craniofacial and oral features in an eighteen-month-old male child. 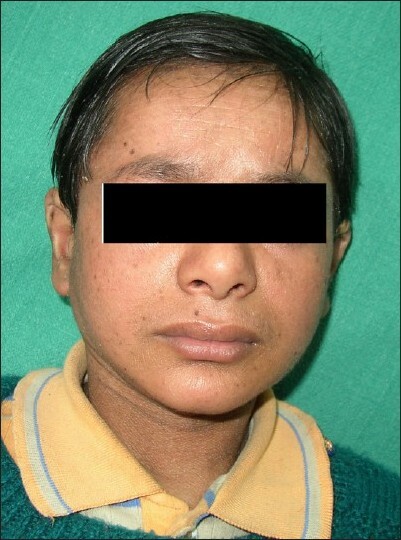 The patient presented with several craniofacial deformities, including brachycephaly, midface hypoplasia, flat face, hypertelorism, ocular proptosis, downslanting palpebral fissures. Syndactylies with osseous fusion of the hands and feet were also observed. Intraoral findings included delayed eruption of teeth, high arched palate with pseudo cleft in the posterior one third. Pierre Robin sequence (PRS) or anomalad, a well-recognized presentation, is the association of the first brachial arch malformation. It presents with a classic triad of micrognathia, glossoptosis, and cleft palate. 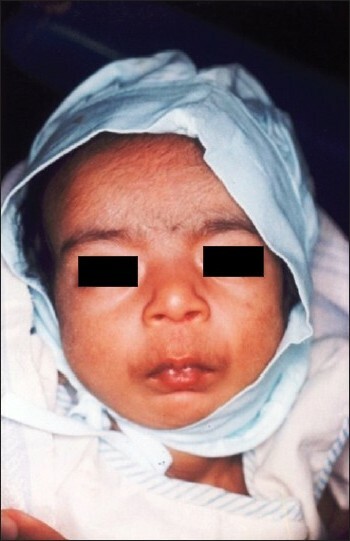 In a neonate with a complete cleft palate, problems with feeding are commonly encountered. 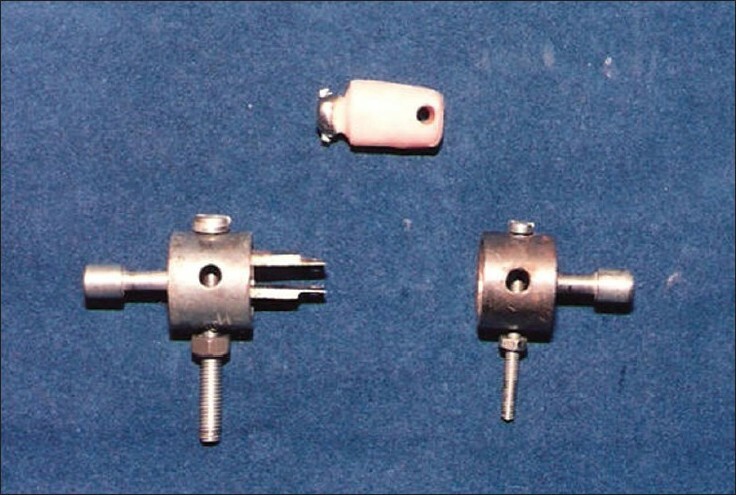 Presented here are two cases with PRS in whom palatal obturators were constructed.